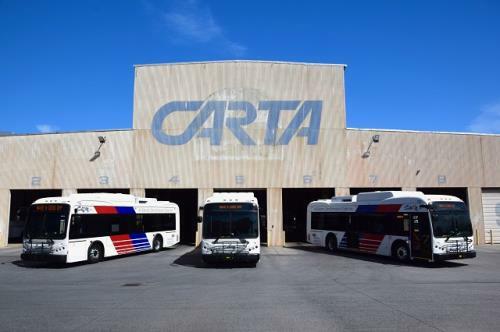 CARTA announced today that it will place its’ new all-electric transit buses into service this week. These brand new 35-foot all-electric transit buses will be added to CARTA’s fixed route service fleet. These electric buses were manufactured by BYD (Build Your Dream) in Lancaster, CA. Founded in 1995, BYD is known as “the official sponsor of Mother Nature”. "BYD’s 35-foot battery-operated electric transit bus is the first of its kind in service worldwide," officials said. "What sets BYD apart is the high performance of its vehicles, the long-lasting battery life, its commitment to being eco-friendly, the affordability of its vehicles compared to diesel, CNG and hybrid alternatives and its safety features."